Zalul, the water protection NGO of Israel, is tremendously proud to announce to a major success in the campaign to save the Lachish River. After three years of campaigning in the city of Ashdod to rescue the Lachish, Zalul stood alongside the Mayor of Ashdod, Dr. Yechiel Lasri, at a press conference on July 6, 2009, to announce the opening of the river to water recreation. Three years ago, Zalul had a vision for a pollution-free Lachish River, believing that we could bring it back to life within three years. In September 2006, Zalul began a public campaign to rescue the Lachish River after years of severe pollution. The main pollution sources were industrial waste water from the Ashdod industrial zone, wastewater from the municipal sewer system, and wastewater from other settlements in the region. As part of the campaign, Zalul demanded that former Ashdod Mayor Zvi Zilker, put an immediate stop to the polluting of the river and assist with its rehabilitation. After a major public campaign in the city building up to the municipal election by Zalul and the election of Dr. Lasri as Mayor of Ashdod, along with members of the Ashdod Environmental Forum to city council, conditions were ripe for real and permanent change to the river. After a long discussion with the major and city council members, regulatory agencies and Zalul, the city of Ashdod promised to fully enforce policy against those who tried to pollute the Lachish River – specifically focusing on the industrial area. The city promised to upgrade the sewage infrastructure, emphasizing the drainage system. Lastly, they agreed that the issue of opening the river for boating and other water recreation would be done in partnership with the Ministry of Health, in order to ensure public health. 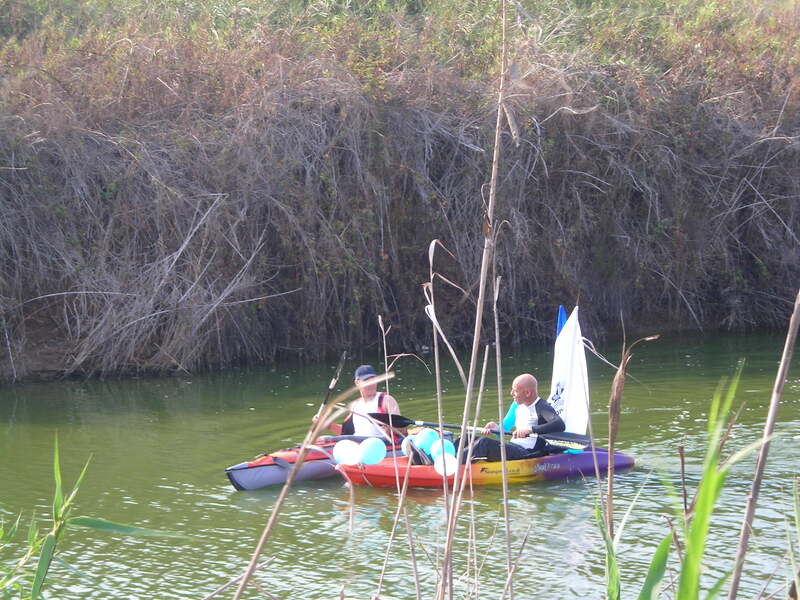 Zalul's Assistant Director, Ezer Fischler (L), kayaks in the Lachish River for the first time in decades with Adi Ben-Lish (R), Director of Park Lachish in Ashdod (Zalul). At the press conference on Monday, July 6, 2009 Mayor Lasri of Ashdod announced that due to the tremendous improvement in water quality the river would be opened officially in mid-August after a trial period. Zalul was a partner in the press conference and approved the improvement in the water quality, but made sure to list our own demands for safety and water quality, to which the City of Ashdod agreed. Mayor Lasri, speaking at the conference, said “I have zero tolerance for pollution of the river and will close any factory that pollutes the Lachish.” Zalul is very proud of the change in the Ashdod leadership that is helping bring about this change in the river. The Lachish River will now be a central part of the city and a major public attraction and place of enjoyment for residents. Zalul will continue to follow developments along the length of the river to ensure its rehabilitation process as well as continuing work upstream from Ashdod. For now, you’ll be able to find us kayaking in the Lachish! Cross posted on the Israel Water Blog. Learn more about Zalul Environmental Association by visiting their website www.zalul.org.